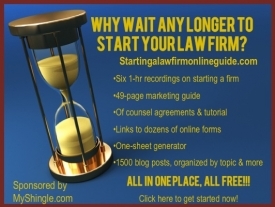 Kudos to the Texas Young Lawyers Association for this innovative project, tenminutementor.com, an online library of video presentations on topics like substantive law (mostly Texas, but some, like the talk on Ten Tips for Federal Court, can apply more broadly), ethics, building a firm and personal development. Here’s the Press Release (2/28/05) that further describes the project. This online mentoring effort is unique in its range and depth. For months, a film crew criss-crossed the state to tape the first wave of more than 60 video lectures by luminaries, including Harry Reasoner of Vinson & Elkins, LLP, “King of Torts” Joe Jamail and Mike Boone, co-founder of Haynes and Boone LLP of Dallas. When the website officially launches March 1, nearly 100 presentations will be available at the click of a mouse. The only possible improvement that I could suggest to this amazing service is to consider a podcast format. That way, lawyers could pop those presentations onto an MP3 player and listen to them over and over again en route to work or at the gym or while waiting in court. But even as a computer-based service, this project is amazing. Thank you to the Texas Young Lawyers division for thinking as big as…the state of Texas!